Whatever your age when you are diagnosed with breast cancer, you will need a circle of support during treatment, especially if you live alone. You need to build that circle right away by reaching out to friends, neighbors, and family members. Don’t expect one or two people close to you to be able to meet all your support needs. Be prepared to identify what help you will need, when, and for how long. People want to help, but they need to know specifically how to help and how long their help will be needed. Having gone through breast cancer twice, I can speak to the need for having a circle of support that can help you through surgery and treatment, especially when living alone, as I did during my first breast cancer. From the day you are told that you need a biopsy to determine whether or not what you or your physician feel in your breast is a cancer, or confirm that what was seen in a mammogram is a cancer, you need to begin your outreach. It is a good idea to have someone drive you to and from the procedure and keep you company while you wait for your biopsy. Once the biopsy confirms you have breast cancer, and you decide where you want to be treated, you need to pick a surgeon associated with the facility you have chosen. Whenever possible, choose a cancer center, rather than a community hospital. Surgeons practicing in a cancer center perform breast cancer surgeries far more frequently than surgeons in a community hospital. Before you select a specific surgeon to see, do your homework; review the surgeon’s credentials, which you can find on the cancer center’s web page. Take a friend or family member with you to meet with the surgeon to discuss your surgical procedure. Be sure your friend or family member is comfortable asking questions you may not think to ask, taking notes for you, and giving you feedback after the visit. Don’t hesitate to get a second opinion. If you are having reconstruction, also take someone with you to meet with the plastic surgeon. Make sure both of you understand what is involved in the different reconstruction options before you leave your meeting. Once you know what surgery you will be having, you can plan for how much help you will need to have immediately following surgery. Someone to spend at least one night with you following surgery. You may be groggy from the anesthetic and need assistance with self-care and preparing something to eat. To stay with family or a friend, or have someone stay with you, in your home, for several days. You will need assistance, initially, with managing your surgical drains, meal prep, and other activities of daily living. Mostly likely you will be on pain medication and still weak and tired from your surgery. You will need someone around for your personal safety and comfort. You will need assistance with dressing, bathing, and washing your hair. Transportation to and from follow-up visits with your breast surgeon and plastic surgeon, if you’ve had reconstruction, as well as seeing other members of your treatment team. Until your surgeon clears you to drive, you will need transportation. Remember to place a soft pillow between you and your safety belt to protect your incision area. someone to go with you to meet with the oncologist to take notes and ask questions you may forget to ask. If you do not feel comfortable with the first oncologist, see a second or third one until you find one who is a fit. Since it may take several months to complete your course of chemotherapy, you need to be comfortable with whomever you choose as your oncologist. a friend to go with you to pick out a wig, or, if you prefer, scarves or hats. It is a good idea to do this before you lose your hair. someone to stay overnight, on treatment days, to be there for you if are unwell. assistance making your home recovery-friendly. Be sure everything is convenient to your bed and lounge chair or sofa. Reorganize your shelves in the kitchen and bathroom, so you do not have to reach to get the items you use most often. Many women and men manage to work during radiation treatment, as radiation fatigue doesn’t usually set in for a few weeks. You have the option of having radiation early in the morning, before going to work, or after work. Some women and men manage to work during chemotherapy, especially those who can work from home. Others may be able to arrange part time employment during the months they are taking chemotherapy. If your work can be accomplished using either of these temporary solutions, it is best to work this out with your employer before you have surgery. In addition to side effects that may make you unable to work, chemotherapy drugs can make you more susceptible to infections. You will be advised to avoid crowds, public transportation, work, and recreational environments that bring you in contact with the public, which will increase your chances of getting seriously ill.
Before resuming your regular exercise routine, be sure to check with your surgeon. Also, get instructions on how and when to begin arm exercises. Walking is a good way to get daily exercise. It gets you out of the house and seeing people. It is a safe and therapeutic means of exercising as you are healing from surgery. It also helps with managing fatigue associated with both radiation and chemotherapy. Going through surgery and treatment for breast cancer can be a lonely and frightening experience, especially when you live alone. It’s important to let friends and family know how much you welcome a visit on the days you don’t feel well enough to go out. Don’t hesitate to accept offers to go out to a movie or lunch, if you are up to eating, or just a short walk or sitting in the park. Pick up a phone and call a friend or family member you know who will understand when fear is getting the best of you. If you know someone who is a breast cancer survivor, she may be your best choice as she can identify with what you are going through, and share what she did and continues to do when dealing with recurrence fears. 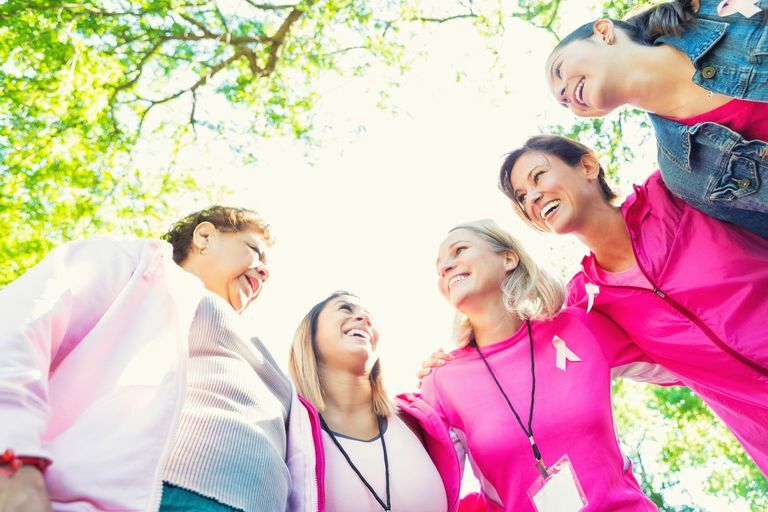 Call the American Cancer Society office in your city or state for a list of breast cancer support groups in your area. If you don’t feel well enough to attend a meeting, many groups have telephone support provided by volunteers who are survivors. A word of caution when talking to a fellow survivor: identify, don’t compare. Everyone’s breast cancer is unique; while there may be similarities in symptoms, treatment, and side effects, no two people experience breast cancer in exactly the same way. Before you begin treatment, get a good supply of reading materials and movies for the times when side effects make it hard to work and resting isn't working. If you're a project or crafts person, plan one and get the materials in while you are feeling well. Keep a journal of your experience; it will help ease the stress of what you are going through to get your feelings out. Some women, who have done this, use their journals to document their cancer experience and include it in their content for blogs and books they began during or after completing active treatment. Breast cancer, like any life-threatening experience, is a time for personal reflection; it's a time to draw up a plan that makes it possible for you to do something you have always wanted to do, but personal and/or work responsibilities have kept you from doing so far. If you are having a mastectomy or bilateral mastectomy, with or without reconstruction, having a private duty nurse or nursing assistant be there just for you during the overnight hours will make all the difference in your comfort level. Overnight hours can be busy ones for hospital staff, and you may have to wait to use the bedpan, and getting help with other activities you cannot do for yourself. Cancer centers and many hospitals have this service; inquire when you may your surgery arrangements. This is usually a fee-based service not covered under most insurance policies. For my first cancer, I chose a community hospital. I got good care and lots of TLC, but had to go to several different providers at several different locations to get treatments they didn't provide. For my second cancer, I chose a cancer center that gave me access to all the care I needed, on-site, from diagnosis to the end of active treatment.